Last week, I arrived home after 8 days in Kansas City, where I participated in the AP Statstics Exam reading. It’s hard work, filled with long days of grading papers. But all the readers seem to take some sadistic delight in this work, and the professional connections made through the week are outstanding. You’ll find that AP Stats teachers enjoy candy….too much so at times my doctor tells me. Last year, Kevin shared his data collection activity with stomp rockets. This year, Kevin upped the ante, with an activity where students launch Gummy Bears, Gummy Worms and other candies using catapults. 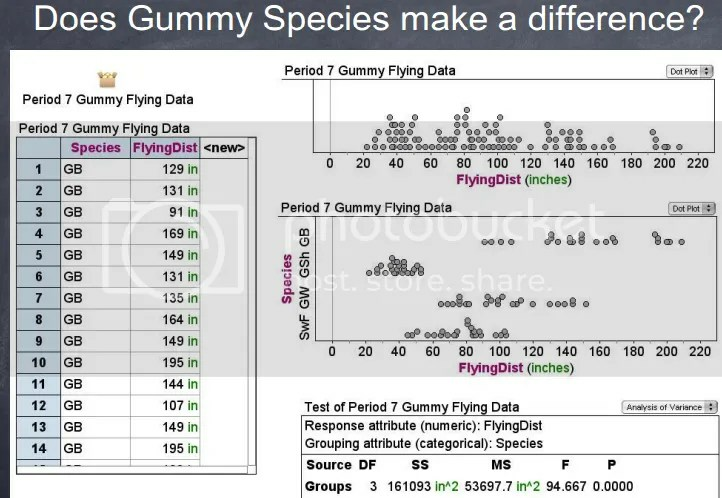 Which type of candy flies farthest? What can we say about the consistancy of the launches? I’m looking to incorporate this into my 9th grade class as an introduction to variability and estimation. Kevin’s presentation on the StatsMonkey site is Keynote. I have converted it here to Powerpoint for us non-Keynote users. Stats teachers have many data collection activities in their arsenal, but this idea from Brianna wins the prize for most off-beat concept. In this activity, students are asked to estimate life expectancy in a population. To collect data, the class uses something readily avilable every day: the obituaries. This presentation was one of the clear highlights of the evening, with many in attendance wondering what a class taught by the hysterically entertaining Brianna would be like! Visit StatsMonkey for her activity worksheet, and use the dead as data! Jigsaw puzzles make for great reviews in just about any math class. 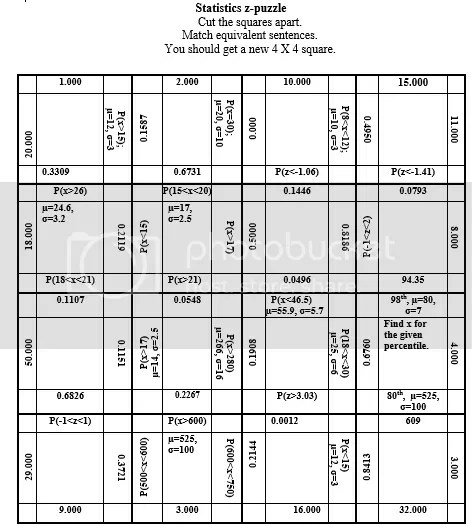 Here, Christine shares puzzles she uses to review the Normal Distribution. Cut out the pieces, find the probabilities and solve the puzzle! Template included. Paul is part of the AP Stats Test Development Committee, and always has great ideas for the Stats Classroom. At the reading, Paul shared his sampling activity, using Air Gun ammo of different colors (and slightly different sizes) to draw small samples from a large population. Using a paddle made from pegboard, random samples can be drawn, leading to a first discussion on inference. Paul promises to share the plans for building your own sampling paddle, so check back on StatsMonkey often! UPDATE: Paul’s presentation has been uploaded to the StatsMonkey Site, along with plans for making your own sampling paddles. I appreciate presentations where speakers attempt to de-tangle a tricky concept in math class. Having students move beyond a “canned” understanding of the coefficient of determination and towards a real understanding of predictive improvement based on an explanatory variable is a worthwhile lesson. In his activity, Doug Tyson challenges students to grab as many Starburst candies (see…I told you Stats folks like cnady) as possible in their hand, then examines the predictive value of using hand size to estimate the number of grabbed candies. How much are our predictions improved by thinking about hand size, as opposed to thinking about the mean? Soon, I will post more resources shared by Chris Franklin, who gave a brief history of stats education during her Professional Night presentation.